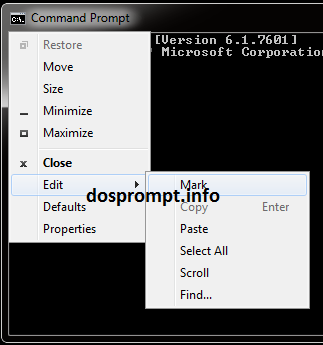 This page explains how to open and close a command prompt, using copy and paste and clearing the screen. It is part of our getting started guide. Windows 10 introduced a lot of new features for the Command Prompt - these are outlined separately. There are two conventional ways to start a Command prompt. Start, Run and type "cmd" (minus quotes) and press enter. You can also use Microsoft power toys to open a command prompt from Windows Explorer. You can read more about the power toys further down this page, here. The screenshot below shows a Command Prompt on Windows 7 - it is almost identical on all other versions of Windows. On Windows Vista and later versions a standard Command Prompt may not allow you to do everything that you need to. In that case you will need to use an elevated command prompt. The best way to start an elevated command prompt is to RIGHT click on the shortcut and choose Run As Administrator. If the prompt is elevated, then the initial path will be C:\Windows\System32. The title bar will also say "Administrator: Command Prompt". If the prompt is not elevated then by default it will start in C:\Users\Username (where username is the username of the account in use) and the title bar will just say "Command Prompt". The example above was configured to start in C:\ . You can close a command prompt either by clicking on the cross in the corner, typing exit and pressing enter, or choosing Close when right clicking the Command Prompt icon on the task bar. However command history is not maintained across sessions, so if you have a lengthy command that you want to use again, it needs to be copied out. When you are working with a Command Prompt, it maybe helpful to increase the screen size or the buffer size. Screen size is what you can actually see on the screen. Buffer size is what is stored and can be viewed by using the scroll bars at the side. To change the screen size and buffer size, right click on the icon in the top left corner of the Command Prompt window and choose Properties. Then click on layout. A good buffer size is height 300, whereas a good screen size is height between 25 and 50. After pressing OK you will be asked if you want to apply the changes to the shortcut or the current window only. If you are testing, select the current window only. Many of the commands will have extra options available, known as switches. They are added to the command by entering a "/" then a letter, number or word. These can change how the tool works or handles the information. A common switch would be the help command, which will also give you information on the other switches available. This will usually bring up information about the command and the available switches. If it doesn't work, try "-?" after the command instead. This writes the content of the help command to a file called xcopy.txt located in the root of the C:\ drive. If you start a command it appears to be looping, showing more than you expect, then you can stop it sing the key combination CTRL-C. If you are interested in simply allowing the text to show, but a screen at a time, then you should use the MORE command. There are a couple of shortcuts that you can use from the keyboard instead of typing full file or directory paths. If the directory you are wanting to change to is very long but uniquely named, then you can use a wild card instead of typing the entire thing. Enter the wildcard character once you have typed enough characters for Windows to only have one choice. Another neat trick if you are using a command prompt on Windows XP or Windows Server 2003 and is to use the "Tab" key to scroll through the files and folders in the current directory. Type the command you want to use as normal, for example "cd" then press tab to cycle through the files and folders until you reach the one you want. Then press enter. You may still have to enter the " as before, so would type " cd " " then press tab until you reached the folder you want to change to, enter the second " to finish off and press enter. This technique can save a lot of time if you need to change to a directory with a long name. It will also let you enter hidden folders that do not appear with dir without having to remember the correct name. If you want to repeat a command that you have just run, or adjust something in the last command, press the "Up" cursor key to bring it back. You can then adjust it and press enter. Useful if you are trying to work out what switches and options you can use to achieve a certain result. History is not maintained across sessions, but is maintained if you use CLS to clear the screen. The first thing to note, which will usually catch newcomers to the Command Prompt out, is that the usual CTRL-C and CTRL-V commands will not work for a command prompt window unless you are on Windows 10. To copy text, such as a long command that you have been using or the results of a command, click on the icon in the top LEFT corner, and then choose Edit, and Mark. The cursor will then change. You can then use the mouse to highlight the text that you want to copy. Once you have done so, press enter. The highlight will disappear, and the text will be copied in to the clipboard. You can then copy it elsewhere, or in to the same Command Prompt Window. To paste text, move the cursor to the point where you want to enter it, using the cursor keys. Then click on the icon in the top left corner and choose Edit, Paste. Enable Copy and Paste Shortcut keys on Windows 10. If you find that copy and paste shortcut keys do not work in a Windows 10 command prompt, right click on the icon with a window open as above, then choose Properties. Ensure that the "Use legacy console" option is NOT enabled. If it is, disable it, then restart the console window. If you have lots of text in your Command Prompt window, this command will clear it. The history of previous commands typed in that session will be maintained. By default, the command prompt will start in your Home directory. This could be "C:\Documents and Settings\Username" or a network drive. If you want to always start in another location, such as the root of the C: drive, then you can change the Shortcut. Right click on it and choose Properties. Change the value in "Start In" to your preferred location. Full Listing of Commands and their Options. If you want a full list of the commands available to you, just type "help" and they will be listed. You can then type "help <command>" for the instructions. Similarly, typing /? after the command will also bring up the full list of options available for that command. A complete list of the built in Commands, along with examples and notes on their use can be found here. If you do a lot of work in the command prompt, then you might be interested in installing the "Command Prompt Here" (Windows 9x, NT and 2000) or "Command Here" (Windows XP) Power Toys. These add a new command to the right click menu you get when you click on a directory allowing you to open a Command Prompt in that directory. You can download these Power Toys from Microsoft's web site. You can purchase books which cover the Command Prompt in more depth from our Amazon Store.